I’m back with some of my fave style trends and passions that are still rocking the interiors world in 2018. From the palest and the prettiest of decors to the darkest and quirkiest of styles, but the one thing I cant resist is a new trend, yup tend to like um all! 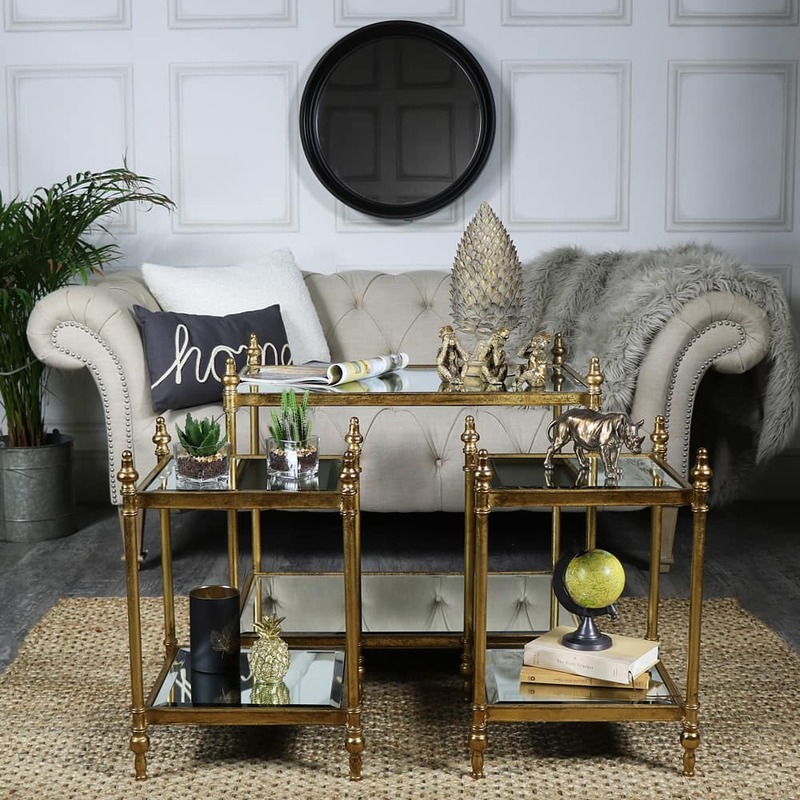 1 Critter chicAdding unusual and exotic birds and animalia to your decor has been around for a little whole now, but the trend is growing, and new animals are becoming must haves all the time. Yes it has extended beyond the flamingo (still love them) to include any creature from an octopus to a leopard, and the high street brands are well and truly on board now, so Its easy to pick up yourself a piece of cute or quirky that will challenge the high end brands offerings for on-trend style. 2. The luxe lookAnd most especially all things gold and shiny and a little bit rock star! – Gold has taken a back seat to silvers and chromes since the 80s, when anyone who had a posh Nana would almost certainly have had gold taps, and it was practically compulsory to take all your friends to look at said taps to impress them. But no more, silver is being budged out, and gold is not just for the posh Nanas! I’m currently in the process of changing my silver kitchen handles and taps to the gold side, and you don’t need to be Midas to make this happen, handles from a few quid on eBay, and full swan neck taps from high street bathroom stores are priced the same as silver – amen to that I say.And it’s not just the taps, even if you just want a piece of the gold stuff, try a pen pot or a mirror, or for all out luxe, the must-have bar cart. And it sits well with so may colours, perfect with pink and white as an undertone, or great against a strong dark colour to shout ‘wow’ at all who pass. So make like an 80’s Nana and give gold a go, I defy you not to fall in love. In this current age, there are more fashion styles for homes than ever before, whilst I don’t have all of them in my home (and boy I have a few!) I admire most tastes in décor. One that has always fascinated me, but never made its way into my home however is art deco. That is all about to change however, as I’m planning a huge project in my games room with a nod to this style at the forefront of my plans. We all love a bit of olden days glamour, and the mystique of the early part of the last century, and most especially the roaring ‘20s and all that surrounded the underworld at that time was summed up in the tale of ‘The Great Gatsby’, the 1920’s novel by F.Scott Fitzgerald, more recently reinvigorated in the blockbuster film , by the great Director Baz Lurman (who knows how to style a film! - see Moulin rouge too for his other amazing similarly styled works of art) in which this look was brought to life in full colour glory and embraced to the max. I have to confess I love a good film, but I’m more likely to be hooked when they have a stunning backdrop! This a time when anyone who was anyone wanted to shorten the length of their skirts, dance, drink alcohol, and live the American dream. Of course a lot of this was either illegal or immoral back then (thankfully not now, otherwise most of us, me included would be well and truly in trouble! )However, I’m not here to judge there (or your) levels of skill or depravity on the dancing and drinking scene! I’m here to talk about the décor of the time, and whoa, did they know how to do glam! You only have to look at programs like Downtown Abbey or the Films based around this era, to see they did rich, opulent and lots of shape and form, the most famous being the art deco period. Colours were dark and rich, and strong and glitzy. 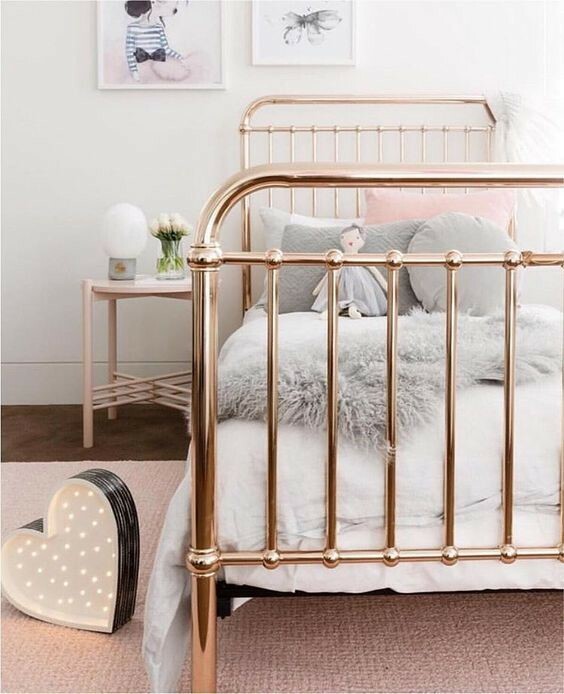 Think velvet, feathers, brass, mirrors, tassels, with bold gold, silver, and black and sumptuous pinks, coppers and whites, and the great news is, we can all put a taste of all or any of those in small or large doses into our home décor. Black and Gold - These 2 colours combined, say wow , striking, lush, warm and rich – try to find angled shapes, in particular fan shapes, here's some great pieces that will add small dashes of the bygone era, or if you fancy a full art deco overhaul, pop on over to the blog to see loads of room scenes and decorating ideas to channel your inner flapper girl or mobster! 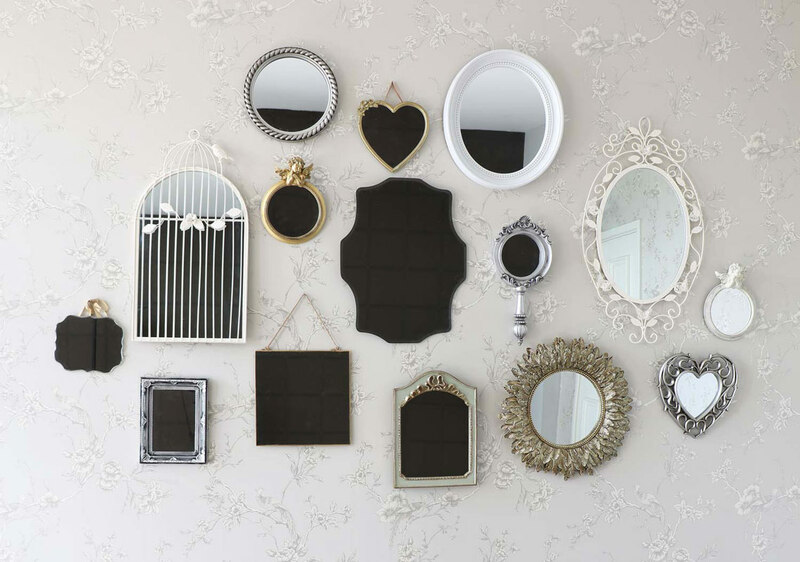 For this reason mirrors are more than just decorative items – they are weapons we use in the war against bad style choices and we love them for it! Summer is here and that means one thing in interior design – florals! Florals have always and will always be a chic style choice due to their versatility. Florals can look great in any room, any colour and to any degree – be it a full room of floral wallpaper or a printed cushion. Florals are one of the easiest ways to give a space a vintage feel. 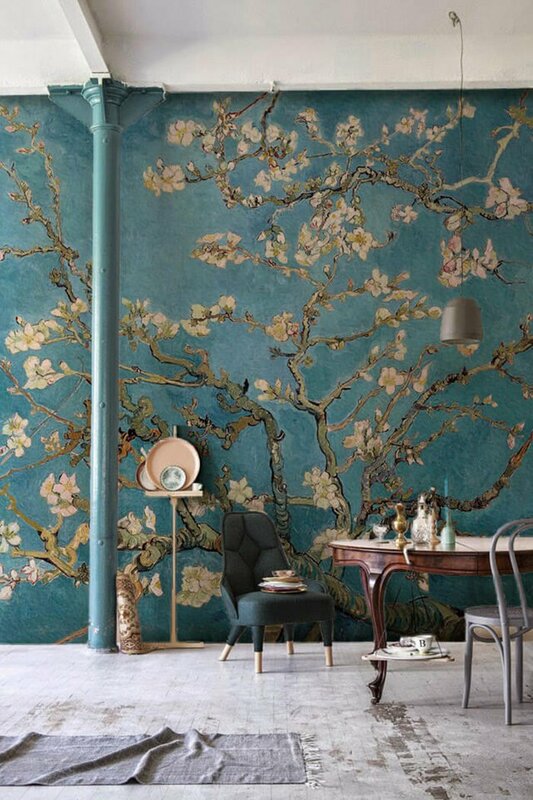 Take the room pictured above decorated with this stunning Almond Branches by Van Gogh Wallpaper. The bold floral design uplifts the room and adds some sophisticated character. 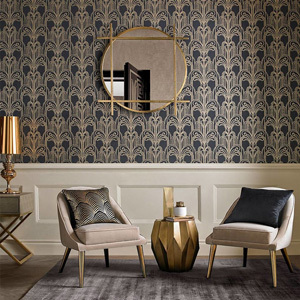 The fact that this is a classic fine art print helps create the desired vintage feel however this paper could be, like it is in the image, paired with not so traditional furniture or decor to keep to a contemporary aesthetic. Gold interiors are back! For a long while gold as a decorative choice was something admired quietly, seen as far too ostentatious for the mass market to apply in their own home due, in part, to gold having always been associated with the aristocracy. However, thankfully, the time has come for us all to add a little royalty to our home décor. And our style choices have increased; white gold, rose gold, yellow gold! You can find any shade to fit your aesthetic. So many colours are fascinating and for various reasons. Some colours for their calming powers, others for their vibrancy or for the way they light up a room. The colour grey however doesn’t traditionally fit into any of these categories and yet it still manages to remain one of the most popular choices for decoration trends. 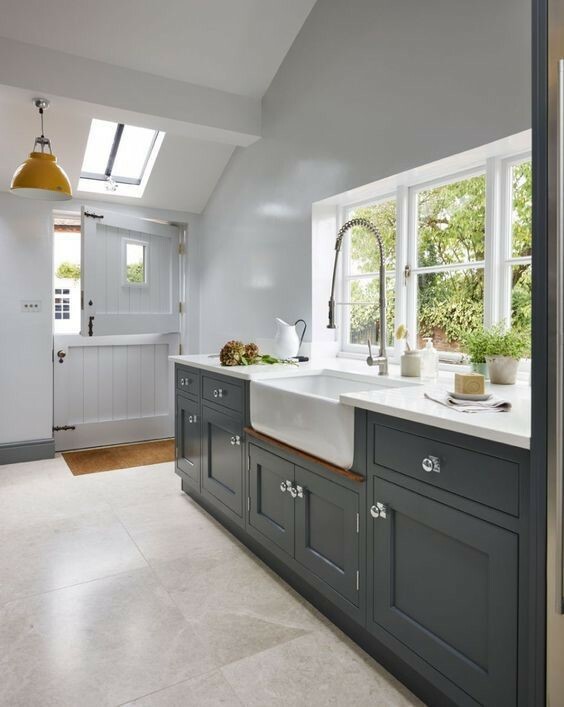 The daring amongst us may go for a dark grey, such as this farrow and ball colour Downpipe. With its blue-black undertones it risks being hard looking. However when complimented with lighter colours, in an airy and light filled space, instead of being overpowering it becomes a bold, enchanting and fabulous choice for walls and cabinetry.